Origin: Laos, Thailand and Myanmar. Company: Can be kept with most small lively fishes..
Aquarium setup: Danio roseus (Rose Danio) is quite sensitve and require optimal water conditions to thrive. Minimum aquarium size 60cm / 23 inches. Danio roseus (Rose Danio) is best kept in groups. Feeding: Will accept flake floods, pellets and live foods such as bloodworms and daphnia. 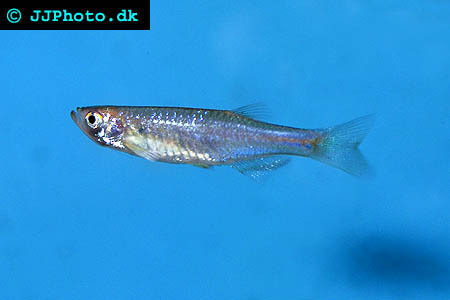 Breeding: Female Danio roseus (Rose Danio) are typically fatter than the males. Sexually mature adults have intense red to the underside. 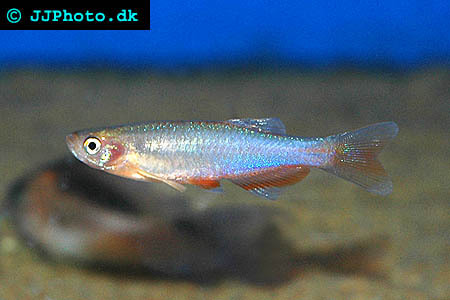 Danio roseus (Rose Danio) are easy to breed and spawn at dusk or dawn. Like all danios they are egg-scatters. The easiest method is using breeding tank with feathery plants and marble substrate, remove adults after eggs are laid.